Here is PART ONE and PART TWO if you’ve missed them. We are now in the “Red Centre” of Australia, thousands of km’s from home, its dry, red, dusty like you wouldn’t believe, I once again haven’t showered in 3 days (standard on this trip), but we are here and loving it so much! We leave Finke Gorge and drive into Hermannsburg (town outside of the park) to buy our pass to drive along the Mereenie Loop. This is aboriginal land so they prefer you to buy a pass ($10) to drive through it, you can buy this at the Hermannsburg fuel station/shop. 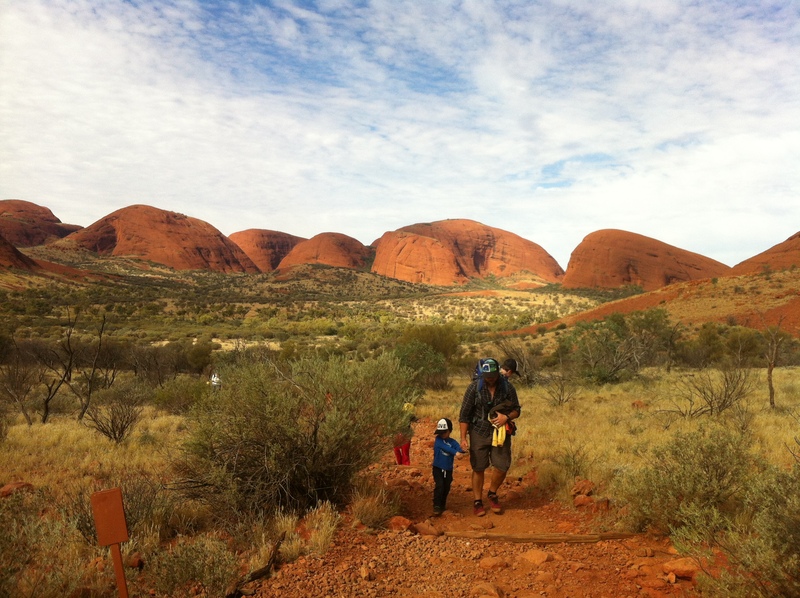 This is known as the adventurers way to Uluru, most people go from Alice and head south to approach Uluru but there is so much more to see if you go west from Alice. 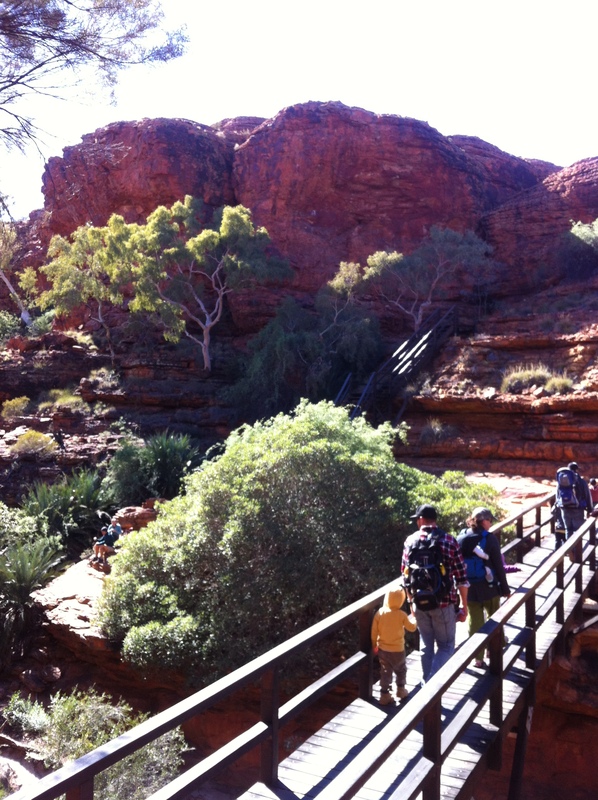 Here you’ll have the MacDonnell Ranges and all the treasure they have to offer, including Stanley Chasm. 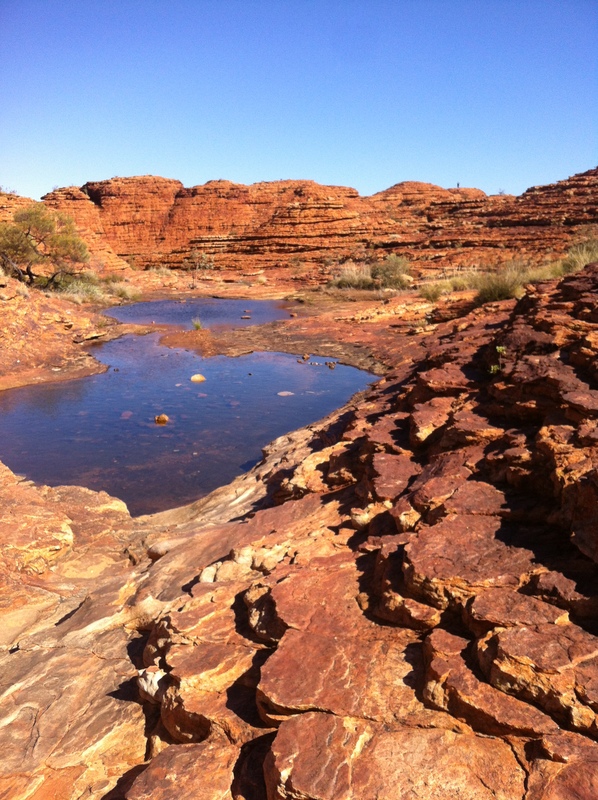 Then you have the gorgeous Finke Gorge and Kings Canyon which is where we are headed at this point before arriving at the BIG rock. The Mereenie Loop is a red dirt road which would definitely be a bumpy ride if the road hadn’t been well maintained in a while. But when we drove, it was fine. The Mereenie loop is only 93kms long but the unsealed section is around 200kms, so obviously takes longer than a normal sealed road. Any car can drive it though. 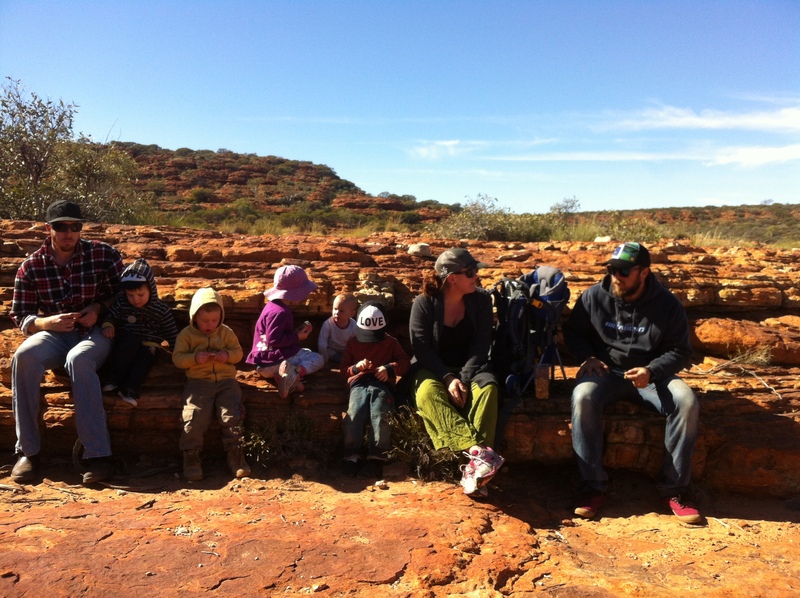 If you stop at the lookout a short distance before you enter Watarrka National Park (Kings Canyon) you get a fantastic view over the park your heading into and good for a tea break. We stayed at Kings Creek station just outside of the national park. With both camels and a playground the kids were pumped. The 6km walk up the Canyon, around the rim and down was the BEST walk of the trip. Yes all the kids came with us! 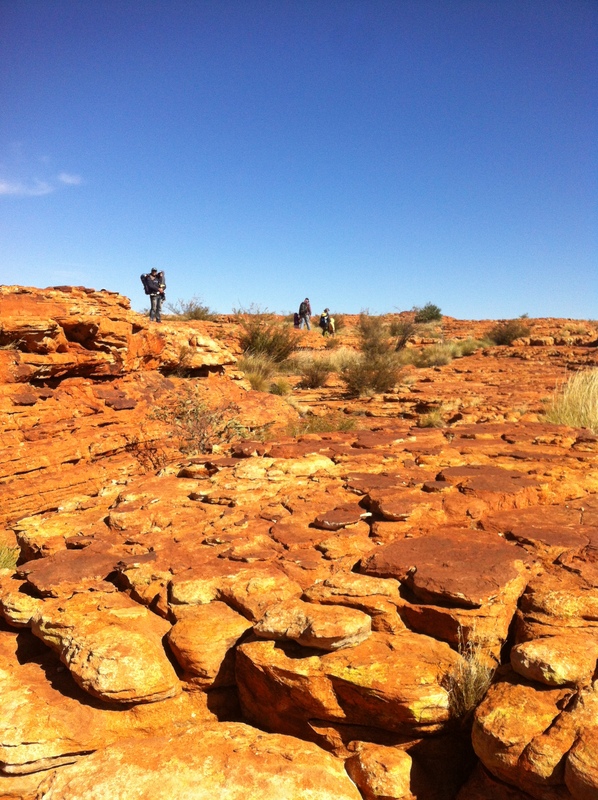 Stunning views, rock formations, water pools, wild flowers, brilliant blue sky above us! Perfection! Yes the kids were exhausted at the end of it and so were we but it was so good! 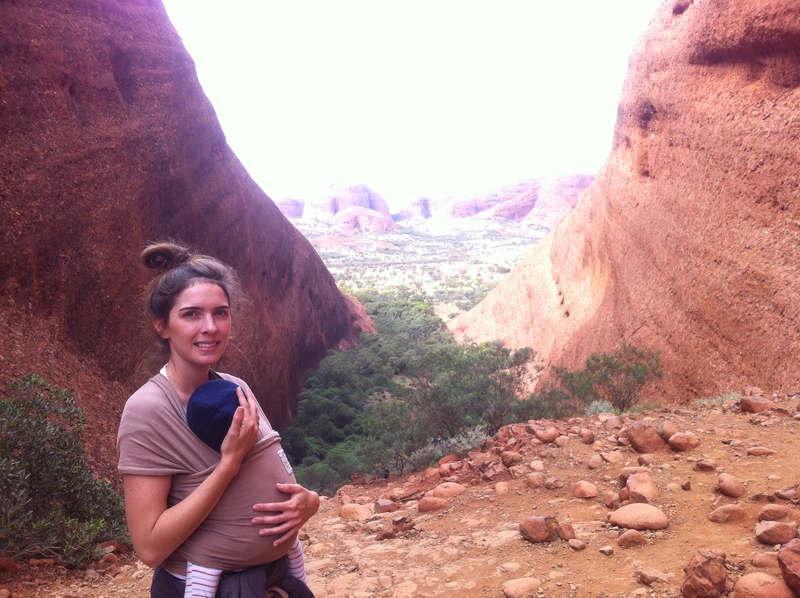 We finally arrived at the day we would see Uluru, we were all excited and I got tricked into thinking I had spotted it in the distance but it was actually Mt Conner, a common mistake made by heaps of people… so I tell myself. But it is a red rock and in the distance kind of looks like the real deal. However you will eventually see Uluru pop up and down on the horizon as you approach, and it is very thrilling to be the first one to spot it! You can make it a competition. Now there are so many different types of accommodation at Yulara, the little tourist community near Uluru, most are VERY expensive so obviously camping is the cheapest and even then that’s still $50 per night. It was nice to be near a supermarket and a Liquor Land though 😉 Both us and our friends took turns babysitting each others kids so we could both go out as a couple and have dinner at the Ilkari Restaurant inside the Sails Resort. We even went there with all the kids one morning for the buffet breaky. Yep, as you can tell we were in need of a bit of luxe living after camping for about 10 days…well I did. Anyway back to what we were really here for! In the cool of the morning (freezing more like it!) we drove into Uluṟu-Kata Tjuṯa National Park, you can only buy a three day pass but you wouldn’t really want any less, you really need a few days here to do everything. So we drove in, watching the big rock grow as we neared it, it’s so BIG, bigger than you think. Just one BIG red rock in the middle of no where, and in the centre of Australia. It is spiritual and a special place, anyone with any feeling or soul can tell. God must of paused when he saw how his landscape formed it. It really seems like it is there on purpose. We did the Valley of Winds walk is lovely and takes you through the giant dome shaped rocks. We walked part way around Uluru, where you can still see the smoky residue from fireplaces and paintings left from past generations of Aboriginal people. One special moment was when we all sat watching the sunset on Uluru, watching it change its colours every 2mins. Then a great big full moon rose up behind it – it was breathtaking, I didn’t want to stop taking in the view. I encourage you make the effort to see these parts of Australia, they really are as beautiful as any special place an expensive airfare can take you. Except they are so unique, so different from any other place in this world. We don’t often get to see the true outback in our city lives, the red deserts, the sound of dingoes at night, stars sparkling like diamonds against a velvet sky, a wild flower growing in a seemingly dead landscape. Beauty found in the driest places, a place that seems so dry and hostile is filled with so much vitality and life! Doesn’t God always use nature to show us things about our human lives? That’s why I love outside. 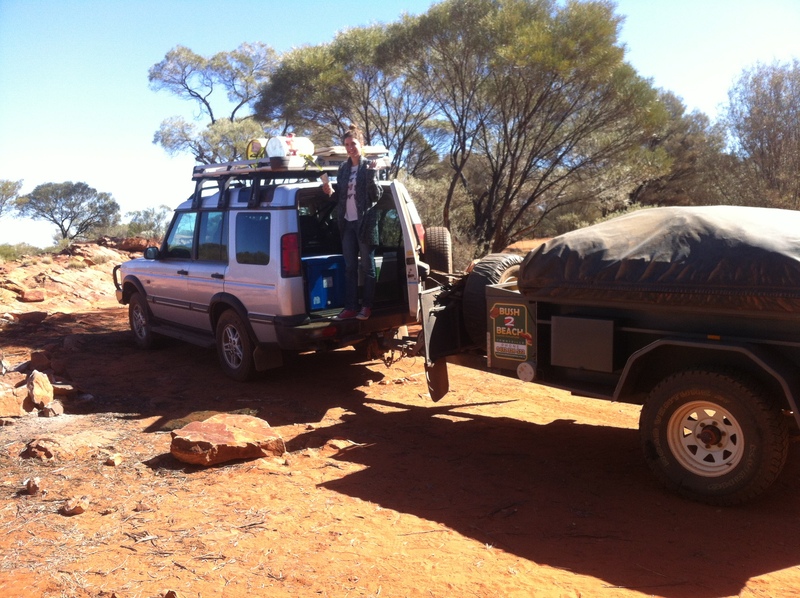 You can be in the middle of the Simpson desert and he is right there beside you. He made outside for us to live in and enjoy! So get out there and see what he has made for you and what he wants to tell you! Get lost and go wild!